I am a big fan of Komodo IDE. I’ve been using it since version 3 way back in 2006 and I still use it now 7 years later. Besides using it for Perl debug, I also use it as a general text editor because the VI keybindings make document navigation easy, the places feature simplifies file navigation, and syntax highlighting can be applied to arbitrary files. I am not a Komodo fanboi, I think Visual Studio is the gold standard among IDEs. Unlike the free version of Komodo IDE – Komodo Edit, the free Visual Studio Express editions come with a debugger. The IntelliSense feature allows for quick parameter selection and easy navigation of large projects, and the syntax highlighting is equivalent to or better than Komodo. Visual Studio is the best editor for those that can develop in their language of choice. 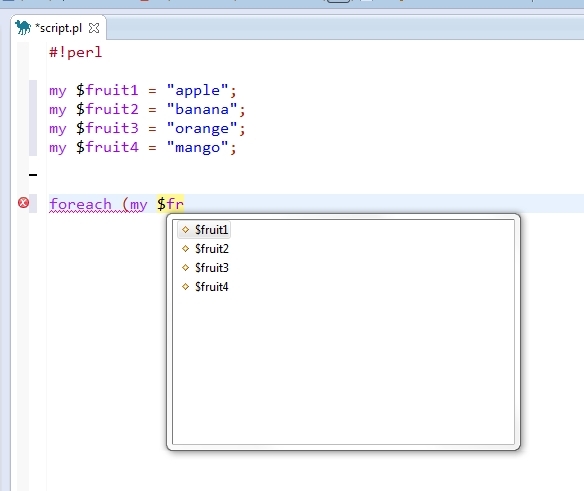 In the Perl IDE space, there is also EPIC – the Eclipse Perl Integration. I played around with it and with the Vrapper plugin it seems to satisfy basic Perl debug. It is a little slow due to the need to run the Eclipse engine and getting Eclipse to recognize arbitrary file extensions is a pain. So with all that said and despite ActiveState’s proclamation that Komodo ‘Revolutionizes Developer User Experience with Komodo IDE 8.0‘, I have to call Komodo IDE 8 the ‘So What?‘ release. New User Interface – Every new software release has a New User Interface and the general trend of software has been towards minimalism. Look at Visual Studio 2012, that interface is new. Nothing new here. Floating Side Panes – Yup, very revolutionary. Been there in every other IDE like Visual Studio and Eclipse since way back. Minimap – Cool, a top level view of the code on the right. Except that the font is unreadable, function headers and variables don’t pop-out to make navigation easy, and zooming in and out is inconvenient. Oh and in Komodo IDE 7 you can easily get the same view with Ctrl+Scroll Down and then go to any part of the code by hovering your mouse over it and doing Ctrl+Scroll Up. Open Files Side Pane – Great I can sort files by file type. I have this option in Windows Explorer. Since Windows 95. Please. Don’t want to alt-tab into another window? Seriously – do you even develop? Retina Display Support – Doesn’t help me. Most of my time is spent in a Windows or UNIX machine debugging Perl and not admiring the resolution of the icons on the task bar. What irks me is that they haven’t fixed anything else or in parts I use: opening and editing over a network is still slow and often locks the entire editor; switching to Komodo with a network file open freezes the editor; there is no variable drop-down a-la Visual Studio or even EPIC; I can’t search in the recent files box; Can’t save a file over another open file; random “this script is taking too long” messages keep popping up. There is even a file that crashes IDE 8 when I apply Ruby syntax highlighting but works fine in IDE 7. These are features that should just work in a IDE that costs money. I do not believe that I’m the only one that is annoyed by these shortcomings. Ultimately there is no new compelling features for me in Komodo IDE 8 that make it a compelling upgrade. EPIC is free, highly capable and and has many of the features in Komodo. Komodo IDE 7 was just released last year and asking for $136 another year later is a purely blatant money grab. EPIC does Perl variable selection dropdowns … Komodo does not. Komodo costs money … EPIC does not. I’ve been using Komodo ever since version 3.5 came out several years ago. I first found out about it while looking for a Windows Perl distribution and happened upon the Activestate website. So, what is Komodo? Komodo is a IDE geared towards dynamic languages like Python/Perl/Tcl/Ruby that runs on all 3 major OS platforms (Windows, Linux, and OSX). It is put out by Activestate, the same company that puts out the most widely used Windows Perl distribution – Activestate Perl. I bought Komodo because I liked the built in Perl debugger and syntax highlighting. I purchased the upgrade to version 4.0 because it added VI keybindings. Version 5.0 didn’t have any features I thought were compelling, but I purchased the upgrade anyway because I wanted to support Activestate. 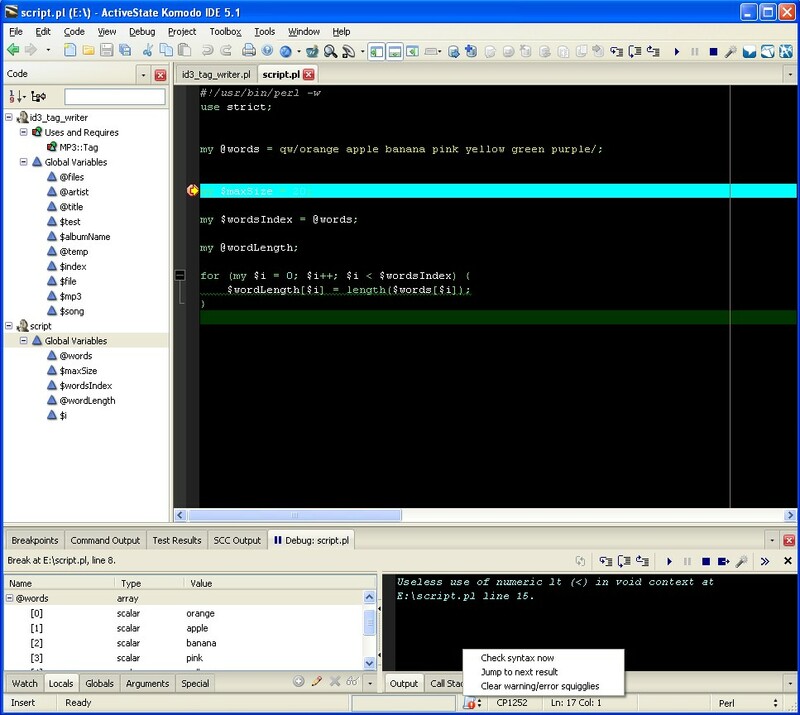 Komodo is a feature rich editor. 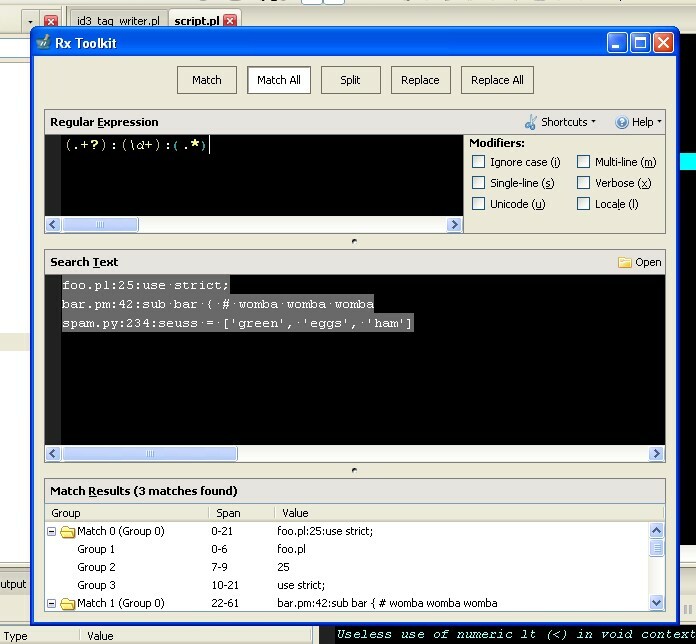 Besides the required syntax highlighting, it has editing of remote files over FTP and SFTP, version control integration, VI emulation mode, a very nifty graphical debugger, http request and response inspector and editor (HTTP inspector), source control integration, a regex constructor (RX toolkit), and an interactive shell that lets you try out commands on the fly. These are just the features I use on a regular basis! Komodo is also extensible via scripts, supports macros, customizable keyboard shortcuts, and much more. Komodo is very user friendly. Besides the VI keybindings, you can also customize the menu by assigning your own key combinations to the commands you use the most. The interface stays out of your way until you need it, the main typing window takes up most of the screen with the quick link buttons listed along the top. You can bring up the debugger or your source control windows at the bottom and there are side tabs to let you quickly access files in your project, variables, and functions. One area that is lacking is the help – it is sparse in some areas, especially on how to access the API and so sometimes I have to resort to trial and error. The syntax highlighting is great, it makes the code readable and there are little red squiggles show you where you have errors in your code. A little drop down pops up when you access member variables, however it is not as comprehensive as Microsoft’s intellisense in that it doesn’t perform the drop-down for every variable. A great feature I use regularly but is not found in most IDEs is the ability to edit remote files over FTP and SFTP. This allows me to get syntax highlighting, code folding, code completion and all the other nifty features of the IDE on files that can only be accessed via SSH or telnet. This is great because a lot of my work is done on UNIX machines that don’t come with fancy editors but allow access via SSH and telnet. I mainly use Komodo for Perl and C/C++ development but I have dabbled with Ruby on Rails using Komodo and it also shines in this area. It has shortcuts to automatically generate scaffolding items and you can watch your site execute using the built in debugger. I’ve discussed the features I use the most and like the best but Komodo has many more features that will interest others who work with different languages or with different needs. Check out their features page for a full list of everything Komodo can do. Activestate also offers a trial version and has a lite version of their IDE in Komodo Edit. Overall, Komodo is great software and I would highly recommend it to anyone who works with dynamic languages. I don’t regret buying it since it has paid me back many times in saving me time and reducing the frustration of debugging code.